I made this pouch using a woven #wefty panel that I produced in a workshop at retreat last year. I used Aneela Hoey’s Big Zip Pouch pattern, adapting the size a bit to fit with the panel. I really like this pouch pattern, having made it before. It’s such a useful size, ~15″x13″, great for fitting projects and WiPs in. It also includes a nice zipper detail. Using the woven panel did mean that the seams were a bit bulky in places, there may have a been a broken needle at one point. If I made another one I might try zig-zagging the panel edges first to see if that makes it any easier. So, this brings my total of Q1 finishes to six. I know it could be more, should be more, but I’m pleased with six. Without the finish-a-long and the committee of motivators, the total would probably only have been two. Bring on Q2, lets see if we can beat my current personal best. Fear not, I can see you looking a little judgy at my one finish for March, I have been doing other sewing too. As I admitted in February’s round-up, I have taken on a new project alongside the FAL list, I’m taking part in the Alison Glass Trinket Quilt sew-a-long. Currently in week four of sharing my blocks over at #trinketsal, I’m keeping up and really loving spending some time with a favourite technique – foundation paper piecing. My finished quilt will be a chequerboard of blue and pink blocks and I’m making about 50 of each. The original pattern has 40 individual blocks, so I need to pick my favourites to duplicate. I’m about halfway there so far, so a day of block sewing is due this weekend. I also attended a workshop last weekend, led by the lovely Katy Jones, where I made a giant 24″ block, destined to become a big cushion. I embraced my stash for this and cut into some of Guicy Guice’s Quantum fabric which I’ve been hoarding, I love the bright, saturated colours and subtle print design. I’ve started the quilting, using some blue metallic thread, but I think this will probably end up being a Q2 finish by the time I get round to making a back for it. And so, Dear Reader, that was my sewing journey for March. In my mind, it felt more productive than the previous month, even if on paper they were about the same. As Spring emerges with more light, more warmth and more colour in the garden I certainly feel like I’ve left my winter funk behind. I’m off to start compiling my Q2 Finish-a-long list, ready for posting when the new link-up opens on April 10th. I’ll be posting it here in the blog when it’s done, so see you then. What a fun pouch!!! I love pouches & bags. What a perfect phrase “embracing my stash”, gotta use that one in the future. Well done for 7 finishes!!! *shakes pompoms* Looking forward to seeing your Q2 FAL list as I am working on mine as well. Looking forward to seeing your Q2 list as well and thanks for the pompom shake. I love that pouch!! (If you have access to an overlocker (maybe a friend with one? ), then perhaps overlocking the edges of the next woven panel would squash them down even more than zigzagging would?) Seven finishes in the quarter is amazing progress – bravo! I’m off to read the post about the newly-finished mini – thanks for furtling! Good idea with the overlocker, not sure who I know who might have one but worth making enquiries if I do another wefty pouch in future. Hi, I’m Alex Fox from Liverpool, UK. Enthusiastic quilter, pouchist and maker of things, Tula Pink fan-girl, fabric fondler and fussy cutter. 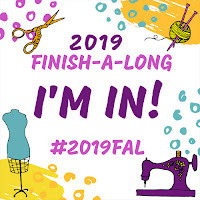 2019 is the year of finishing projects rather than starting them – so follow along with my finish-a-long, I’d love your support.